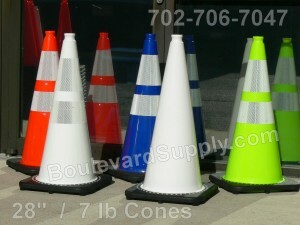 Boulevard Supply carries 28 inch orange reflective traffic cones. These 28″ PVC traffic cones feature the 6″ and 4″ reflective collar that meet both MUTCD standard and NCHRP-350. Each cone weighs 7 pounds which makes them an ideal choice for day or night highway use. The 28″ height is more visible at a longer distance than the 18″ cones. Reflective traffic cones are ideal for night use as they reflect the car headlights making them more visible to drivers.